This boutique style 2 piece outfit includes a t-shirt top which features an adorbale patriotic themed applique that says "Red, White & Cool"; the shirt is accompanied by a matching pair of firework print shorts. This outfit is made with a soft blend of 95% Egyptian cotton and 5% lycra; Available in sizes 2t to 8 years. Perfect for showing off your American pride this Independence Day or any day! WHAT KIDS LOVE: Comfort and Fireworks! The adorable red, white and blue firework prints are reminiscent of the American flag and perfect for your little boy this Independence Day; and the soft Egyptian cotton will make this outfit his favorite! EGYPTIAN MANUFACTURED: Egypt has maintained its reputation for high quality textile and garment production since ancient times; and that's exactly what we sought in our manufacturing process. The 95% high quality Egyptian cotton and 5 % stretchy lycra fabric is cool, breathable and flexible. Premium dye's ensure that your outfit won't fade or run. You won't get any fuss about putting this one on! 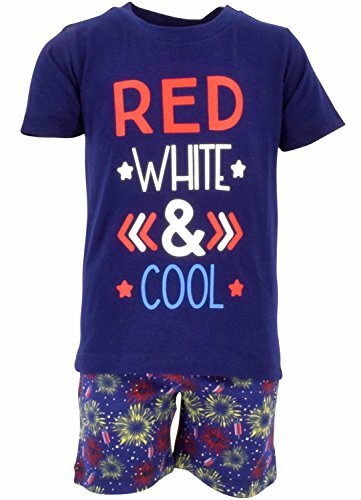 STYLE [RED, WHITE & COOL]: Perfect for your cool kid this 4th of July or anytime you want to show off your patriotic spirit! The adorable applique says "Red, White & Cool" on the t-shirt and the firework print on the accompanying shorts adds extra patriotic flare. This outfit is the perfect addition to your little one's wardrobe. GIFTABILITY: Makes a perfect 4th of July gift or "just because" for your very own love. UNIQUE BABY: Committed to quality and to your satisfaction, Unique Baby has an outfit for every holiday! If you have any questions about this product by Unique Baby, contact us by completing and submitting the form below. If you are looking for a specif part number, please include it with your message.